For other uses, see Chartist. Both nationally and locally a Chartist press thrived in the form of periodicals, which were important to the movement for their news, editorials, poetry and (especially in 1848) reports on international developments. They reached a huge audience. The Poor Man's Guardian in the 1830s, edited by Henry Hetherington, dealt with questions of class solidarity, manhood suffrage, property, and temperance; and condemned the Reform Act of 1832. The paper explored the rhetoric of violence versus non-violence, or what its writers referred to as moral versus physical force. It was succeeded as the voice of radicalism by an even more famous paper: the Northern Star and Leeds General Advertiser. The Star was published between 1837 and 1852, and in 1839 was the best-selling provincial newspaper in Britain, with a circulation of 50,000 copies. Like other Chartist papers it was often read aloud in coffee houses, workplaces and the open air. Other Chartist periodicals included the Northern Liberator (1837–40), English Chartist Circular (1841–3), and the Midland Counties' Illuminator (1841). The papers gave justifications for the demands of the People's Charter, accounts of local meetings, commentaries on education and temperance and a great deal of poetry. The papers also advertised upcoming meetings, typically organised by local grass roots branches, held either in public houses, or in their own halls. Research of the distribution of Chartist meetings in London which were advertised in the Norther Star shows that the movement was not uniformly spread across the Metropolis, but was instead clustered in the city's West End where a group of Chartist tailors had shops, as well as in Shoreditch in the east, and relied heavily on pubs that also supported local friendly societies. Readers also found denunciations of imperialism—the First Opium War (1839–42) was condemned—and of the arguments of free traders about the civilizing and pacifying influences of free trade. In 1837, six Members of Parliament and six working men, including William Lovett (from the London Working Men's Association, set up in 1836) formed a committee, which in 1838 published the People's Charter. This set out the six main aims of the movement. The achievement of these aims would give working men a say in law-making: they would be able to vote, and their vote would be protected by a secret ballot; and they would be able to stand for election to the House of Commons as a result of the removal of property qualifications and the introduction of payment for MPs. None of these demands was new, but the People's Charter was to become one of the most famous political manifestos of 19th century Britain. The state hit back. Several Chartist leaders were arrested, including O'Connor, George Julian Harney, and Thomas Cooper. During the late summer of 1842, hundreds were incarcerated; in the Pottery Riots alone, 116 men and women went to prison. A smaller number, but still amounting to many dozens – such as William Ellis, who was convicted on perjured evidence – were transported. One protestor, Josiah Heapy (19 years old), was shot dead. However, the government's most ambitious prosecution, personally led by the Attorney General, of O'Connor and 57 others (including almost all Chartism's national executive) failed: none were convicted of the serious charges, and those found guilty of minor offences were never actually sentenced. Cooper alone of the national Chartist leadership was convicted (at a different trial), having spoken at strike meetings in the Potteries. He was to write a long poem in prison called "The Purgatory of Suicides." After the defeat of April 1848, there was an increase rather than a decline in Chartist activity. In Bingley, Yorkshire, a group of "physical force" Chartists led by Isaac Ickeringill were involved in a huge fracas at the local magistrates' court and later were prosecuted for rescuing two of their compatriots from the police. The high-point of the Chartist threat to the establishment in 1848 came not on 10 April but in June, when there was widespread drilling and arming in the West Riding and the devising of plots in London. :116–22 The banning of public meetings, and new legislation on sedition and treason (rushed through Parliament immediately after 10 April), drove a significant number of Chartists (including the black Londoner William Cuffay) into the planning of insurrection. Cuffay was transported, dying in Australia. In Kennington, the Brandon Estate features a large mural by Tony Hollaway, commissioned by London County Council's Edward Hollamby in the early 1960s, commemorating the Chartists' meeting on 10 April 1848. Chartism did not directly generate any reforms. It was not until 1867 that urban working men were admitted to the franchise under the Reform Act 1867, and not until 1918 that full manhood suffrage was achieved. Slowly the other points of the People's Charter were granted: secret voting was introduced in 1872 and the payment of MPs in 1911. Annual elections remain the only Chartist demand not to be implemented. Participation in the Chartist Movement filled some working men with self-confidence: they learned to speak publicly, to send their poems and other writings off for publication, to be able, in short, to confidently articulate the feelings of working people. Many former Chartists went on to become journalists, poets, ministers, and councillors. Political elites feared the Chartists in the 1830s and 1840s as a dangerous threat to national stability. In the Chartist stronghold of Manchester, the reform movement undermined the political power of the old Tory-Anglican elite that had controlled civic affairs. However, the reformers of Manchester were themselves factionalised. After 1848, as the movement faded, its demands appeared less threatening and were gradually enacted by other reformers. After 1848, middle class parliamentary Radicals continued to press for an extension of the franchise in such organisations as the National Parliamentary and Financial Reform Association and the Reform Union. By the late 1850s, the celebrated John Bright was agitating in the country for franchise reform. However, working class radicals had not gone away. The Reform League campaigned for manhood suffrage in the 1860s, and included former Chartists amongst its ranks. 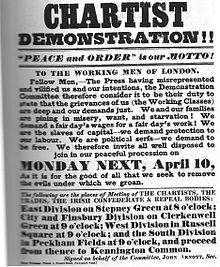 Chartism has also been regarded by historians as a forerunner to the UK Labour Party. ^ a b c d Dorothy Thompson, The Chartists: Popular Politics in the Industrial Revolution (1984). ^ Minute Book of the London Working Men’s Association. British Library 2018. Retrieved 1 April 2018. ^ Williams, David (1939). John Frost: A study in Chartism. Cardiff: University of Wales Press Board. pp. 100, 104, 107. ^ Joan Allen and Owen R. Ashton, Papers for the People: A Study of the Chartist Press (2005). ^ Bob Breton, "Violence and the Radical Imagination", Victorian Periodicals Review, Spring 2011, 44#1 pp. 24–41. ^ Cris Yelland, "Speech and Writing in the Northern Star", Labour History Review, Spring 2000, 65#1 pp. 22–40. ^ Navickas, Katrina (2015). Protest and the Politics of Space and Place, 1789–1848. ^ Navickas, Katrina; Crymble, Adam (2017-03-20). "From Chartist Newspaper to Digital Map of Grass-roots Meetings, 1841–44: Documenting Workflows". The Journal of Victorian Culture. 22 (2): 232–247. doi:10.1080/13555502.2017.1301179. ^ Shijie Guan, "Chartism and the First Opium War", History Workshop (October 1987), Issue 24, pp. 17–31. ^ "The six points | chartist ancestors". chartist ancestors. Retrieved 2017-04-12. ^ Edward Royle, Chartism (1996), p. 30. ^ a b Jenkins, Mick (1980). 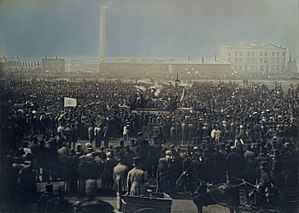 The General Strike of 1842. London: Lawrence and Wishart. ISBN 978-0853155300. ^ F.C. Mather, "The General Strike of 1842", in John Stevenson R. Quinault (eds), Popular Protest and Public Order (1974). ^ Kuduk, Stephanie (1 June 2001). "Sedition, Chartism, and Epic Poetry in Thomas Cooper's The Purgatory of Suicides". Victorian Poetry. 39 (2): 165–186. doi:10.1353/vp.2001.0012. Retrieved 27 April 2018 – via Project MUSE. ^ "Welcome to Chartist Ancestors - chartist ancestors". chartist ancestors. Retrieved 27 April 2018. ^ "Rosedene". National Trust. Retrieved 27 April 2018. ^ a b David Goodway, London Chartism, 1838–1848 (1982). ^ John Saville, 1848: The British State and the Chartist Movement (1987), pp. 130–99. ^ Keith A. P. Sandiford, A Black Studies Primer: Heroes and Heroines of the African Diaspora, Hansib Publications, 2008, p. 137. ^ See especially R.G. Gammage, History of the Chartist movement (1854); J.T. Ward, Chartism (1973). ^ See also James Epstein, Lion of Freedom: Feargus O'Connor and the Chartist Movement (1982); Malcolm Chase, Chartism: A New History (2007); Paul Pickering, Feargus O'Connor: A Political Life (2008). ^ Keith Flett, Chartism after 1848 (2006). ^ Marx-Engels-Werke, Berlin (DDR) 1960/61, vol. 8, 9, 10, 27. ^ Ingolf Neunübel: Zu einigen ausgewählten Fragen und Problemen der Zusammenarbeit von Marx und Engels mit dem Führer der revolutionären Chartisten, Ernest Jones, im Jahre 1854, in: Beiträge zur Marx-Engels-Forschung 22. 1987, pp. 208–217. ^ Pereira, Dawn (2015). "Henry Moore and the Welfare State". Henry Moore: Sculptural Process and Public Identity. Tate Research Publication. Retrieved 2 October 2017. ^ Devine, T.M. (2000). The Scottish Nation 1700-2000. Penguin. p. 279. ISBN 9780140230048. ^ "Hymns and the Chartists revisited". richardjohnbr.blogspot.co.uk. Retrieved 27 April 2018. ^ Calderdale Libraries, Northgate (15 July 2009). "National Chartist Hymn Book: From Weaver to Web". Retrieved 27 April 2018. ^ Edward Stanley, 1839, "A Sermon Preached in Norwich Cathedral, on Sunday, August 18th, 1839, by the Right Reverend the Lord Bishop of Norwich, before an assemblage of a body of mechanics termed Chartists"
^ Gabriel Tortella (2010). The Origins of the Twenty First Century. p. 88. ^ Giles Fraser (2012-10-05). "Before we decide to write off the Occupy movement, let's consider the legacy of the Chartists". The Guardian. ^ "BBC - KS3 Bitesize History = The Chartists: Revision". BBC. ^ Carlyle, Thomas. "Chartism". Retrieved 27 April 2018 – via Wikisource. Saunders, Robert. "Chartism from Above: British Elites and the Interpretation of Chartism", Historical Research 81:213 (August 2008): 463-484 (DOI).